Moving away from the pagan black metal of their earlier albums, German duo Helrunar have made a serious step sideways with this, their fourth album. Keeping the cold, icy atmospheric touch that made previous albums enjoyable but moving away from the early Enslaved sound towards something slower and doomier, Helrunar have much more of their own identity on show. It makes for a gripping album; the slab-like riffing of the opening title track soon turns doomy, almost gothic at points, like a blackened Paradise Lost, setting the scene well. The percussive Der Endkrist follows, driven by Watain-esque melodic riffing beneath pounding drums and vicious vocals from Skaldr Draugir, the band as a whole sounding more Marduk-esque than I'd previously ever heard. Echoes of their previous sound are still very much present and correct – the opening to Totentanz may be strident and almost groovy, for example, but the droning riffs and spoken vocals that follow could be from the band's earlier albums, and the monk-like chanting that closes the song is a great atmospheric choice. Devils Devil Everywhere is the first English song of the band to my knowledge, and taken on its own sounds very modern against the Norwegian-influenced sound of earlier Helrunar material, yet the chilling, Secrets of the Moon-esque grooves work terrifically alongside the sampled passages of witch-hunting. The torrential pounding of Magdeburg Brennt works well because of the grooving riffs, still very black metal, but enjoyably metal as well. You sense that this is a transitional album in some ways, as Helrunar's faults are as much on show as their strengths – the impenetrable German spoken word passages are still everywhere, and songs are still far longer than they need to be. But credit has to be given where credit is due – moments like folky singalong Grimmig Tod are sinister, Die Kirch ist Umgekehret does groovy yet creepy black metal almost better than Khold themselves, and the band's overall atmospheric touch remains strong while they shift their sound. Hell, for a second-division black metal band to make thoughtful advances at all is praiseworthy. 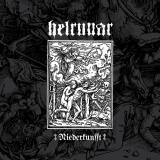 Helrunar are still an enjoyable band, and with Niederkunfft they're on the way to becoming a vital one.